It’s good. If you’ve waited this long to find out whether or not you should get Tales from the Borderlands, I really don’t know what to say to you. If you haven’t finished it or even played it yet, then you should really go remedy that before continuing to read what I have to say here. There is a concept of the innovator and master in art. The idea that some artwork innovated on a concept and later some other artwork showed mastery of that innovated technique or style. There’s a whole lot of problems with this reductive idea, but let’s play fast and loose for a little bit and run with it. In this sense, Telltale finally struck upon a formal style of adventure game that worked for them with 2012′s The Walking Dead. Then you could say the hit a problem because all these years later, the first season of The Walking Dead is a masterwork that Telltale didn’t see the need to push their innovation to become a mastery. Now like I said there’s a whole host of problems with the concept of innovation/mastery and really it’s just a thought exercise I was introduced to in college to get brain cells working and not a serious theory. The most obvious problem with it is, what if the innovation is shown to be a mastery? Which begs the question, what is mastery? And so on. In reality, the “mastery” of formal craft and style seen in one work of art can easily be seen as complete folly when transposed into another work of art. True “mastery,” if one can even acknowledge the concept as such, comes from not only executing techniques with skill and precision, but knowing when to execute what techniques for any given specific work. Or in the case of Tales from the Borderlands, knowing that the Telltale style of adventure game is not going to function the same in a action-comedy the same way its going to function in a horror-drama. Or really, that the same execution isn’t going to hold up between two season of the same property. Tales from the Borderlands is still recognizably a Telltale game. It doesn’t really mix up the basic formula mechanically. However, they do play with the formula. Everything from the notifications to how the QTE play out and what they represent are turned on their head for the sake of the specific situation at hand. I think the main problem with the Telltale formula is that it has become thought of as a formula. While the narrative beats may be interesting, spend enough time with their games and you know what is going to happen next structurally. After the cliffhanger from last time, episode 5 resolves AI Handsome Jack taking over the Hyperion station by crashing the station into right into the planet. Then resolves the trouble with Vallory and her cohorts, by having them realize that opening the vault was a massive mistake. The door is shut and the most of the gang dies. Rhys completes his character arc of resolving wanting to be on top of the food chain with his nature as a rather ok guy. The story ends and we are brought back into the present with the man with the gun holding Rhys and Fiona hostage. Remember him? Remember this framing device? One climax leads right into another build up. In fact, most of the game is resolved with still half of the play time still to go. Over all these arcs of finding oneself and making the difficult choices, I forgot what the actual point of the whole adventure was in the first place: to open a vault for some sweet alien treasure. It plays as a mix of a dénouement and a second climax. We finally get to resolve everything that has been built up of the course of the last few episodes. Which builds up to one more hell of a set piece. A set piece that really exemplifies what I love so much about Tales from the Borderlands. It’s like some of that irreverence of the Borderlands franchise rubbed off on the development team and allowed them to do things with their own formula for no other reason than they could. Because for a good chunk of this final set piece, Tales from the Borderlands turns into a fighting game. Yes, it’s using the same mechanics regarding button prompts as it has for QTEs, but by changing the implementation, timing and surrounding context, I am now playing a fighting game using a giant robot in a Telltale adventure game. There are plenty of small changes or one off moments throughout the five episode run that can be cited as examples of using the parts of the Telltale formula and tweaking them just enough to be a new thing. The whole unreliable framing narrative is a major one I should have probably gone into more detail over the course of five reviews. Mostly these end up being additional jokes, but sometimes they become narrative indicators to shows where and how the story is progressing. Rhys heads up display for his mechanical eye is a prime example. 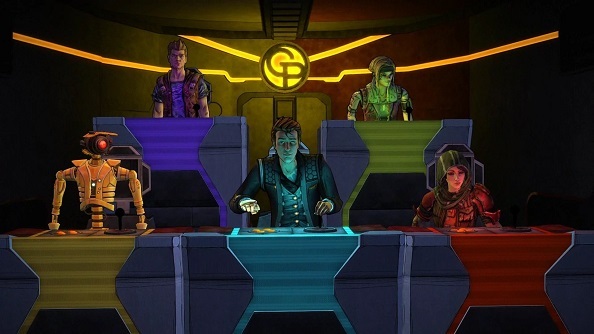 But with this giant robot fighting set piece, we see a magnified totem of Telltale’s willingness to alter, change and evolve their formula into something new and into something that is lead around by the needs of the story instead of forcing the story to conform to the needs of a calcified formula.